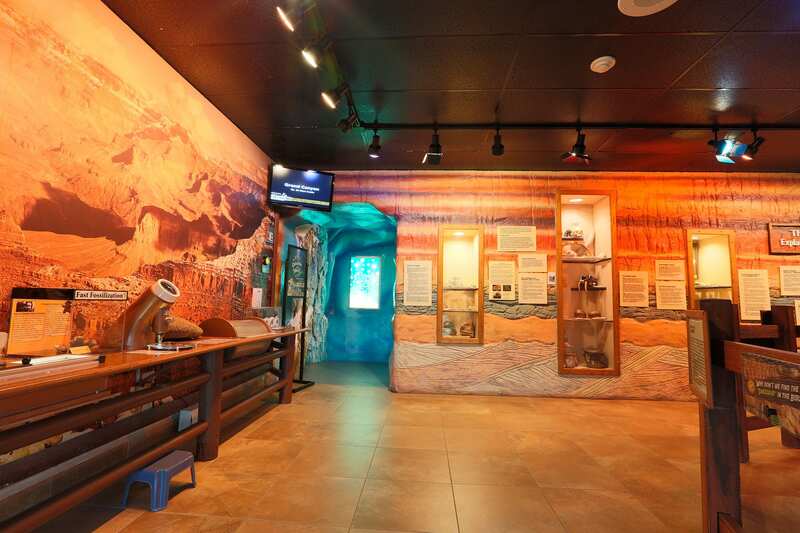 The exhibits in the Creation & Earth History Museum are based on true Biblical history, beginning with Creation in Genesis 1. This journey will continue through the rebellion of humanity against the Creator, the worldwide Flood of Noah’s time, the dispersion at Babel, the history of Israel and the Gentile nations, the redemptive work of Jesus Christ, and the consummation of God’s purposes for creation when Jesus returns. 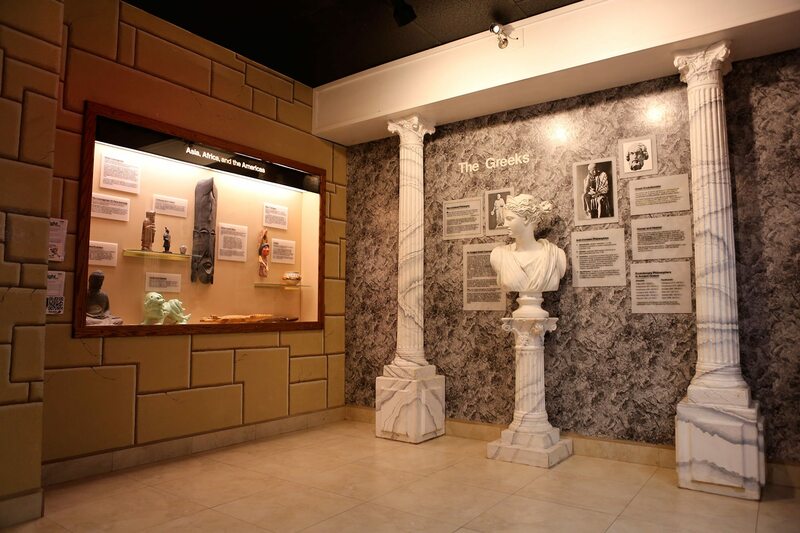 Many museum exhibits are also devoted to explaining how modern day scientific and historical evidence confirms the biblical account, and some such as the Human Anatomy Wing, showcase the miraculous, ingenious, and harmonious biological structures that our Creator has designed for life. 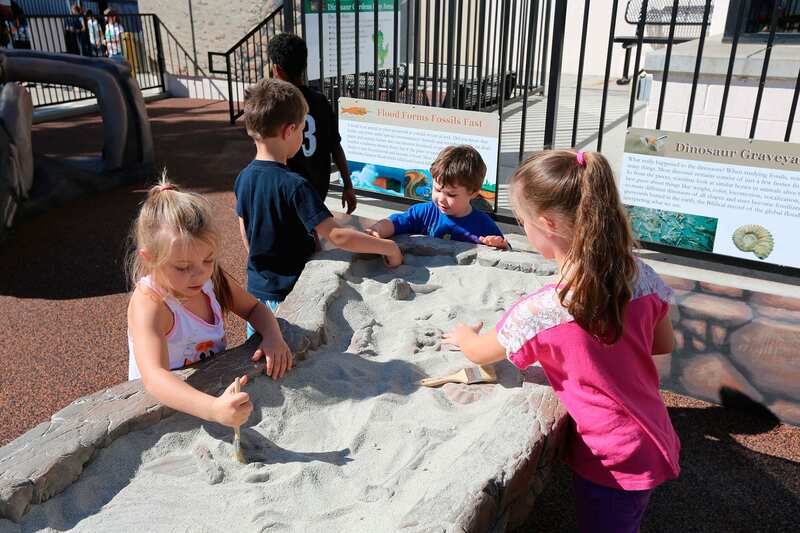 You’re children can imagine they’re paleontologists as they sift through the sand to unearth detailed fossil replicas at the fossil dig table, have fun scaling the Tyrannosaurus skeleton climber, or pondering the meaning of soft tissue in dinosaur bones as seen in the giant sauropod femur bone replica! This area also features the security of a poured in place rubber ground surface to keep little ones safe as they explore and play. 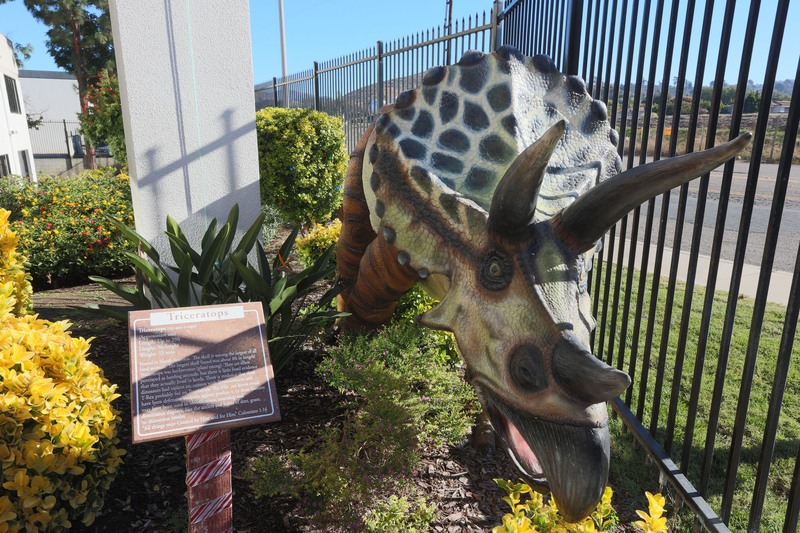 Come walk through our beautifully landscaped garden areas and see detailed sculptures of insects, mammals, life-size dinosaurs and other reptiles and imagine what the world must have been like before the Genesis Flood. Don’t miss the outdoor live reptile habitats where you can see God’s handiwork first hand. Stop and observe the many different species of turtles and tortoises doing just what they were designed to do! At times you or your child may even get to participate in the feeding of these animals! 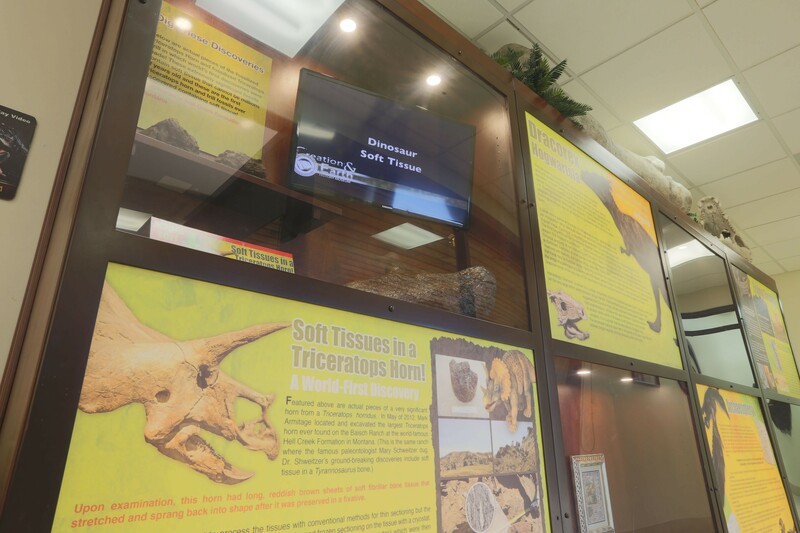 Immediately inside the museum you will find the Dinosaurs and the Bible Exhibit featuring the world class discovery of soft tissues in dinosaur bone! Join scientist Mark Armitage as he unveils preserved soft tissue from a triceratops horn, frill, and condyle from the Hell Creek formation in Montana and see the actual fossils that housed the tissue. This is the world’s first scientific discovery of soft tissue in the horn of a triceratops, and pieces of the actual horn are on display here at the Creation & Earth History Museum! 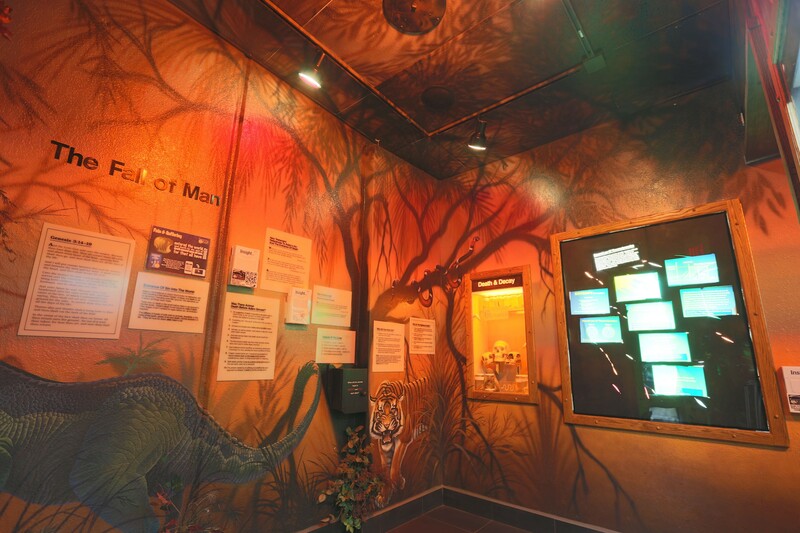 You can also examine accurate recreations of historical artifacts from around the world that provide compelling evidence of man’s past interactions with dinosaurs. 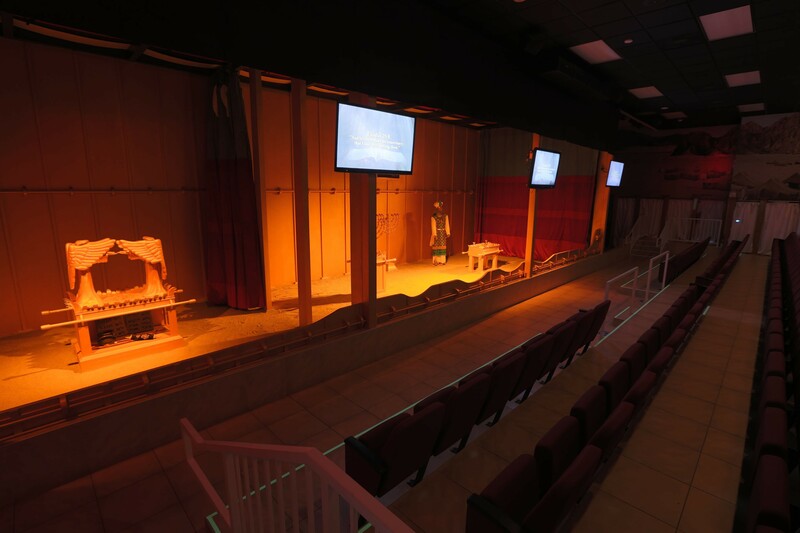 See our life-sized model of the Tabernacle as detailed in the Bible! God created man to have a friendship with God. The Tabernacle represents God’s symbols for a clear explanation of his terms of reconciliation and an object lesson of how God will redeem man and continue a relationship. Ponder the big questions of life and mortality, God’s existence, the origin of life, science and religion, and the importance of the issue of our worldviews as you consider the acts of God on these first three days of creation. See how visual representations bring these primary works of the creation of the heavens and earth to life, such as the formation of: the earth, the earth’s water, atmosphere, dry land masses and plant life. Imagine the unfathomable intelligence, foresight, power, and care that went into the establishment of mankind’s nest, the planet earth. In this exhibit you can get a glimpse of the wondrous accomplishments of God’s creation on the fourth day of the creation week. These include the special creation of the sun, moon, and the instantaneous formation of the innumerable celestial bodies of the universe. Explore the obviousness of design of the universe, the origin of the solar system, the significance of the constellations, the fallacies of the Big Bang Theory and cosmic evolution, and discover evidence for a “young” universe! 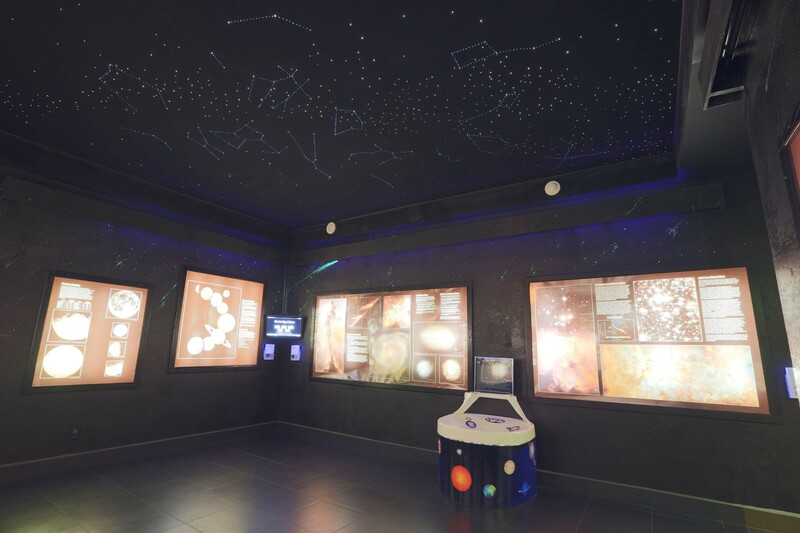 Don’t miss the brilliant fiber optic star ceiling overhead depicting an accurate representation of the night sky in Jerusalem 2,000 years ago. 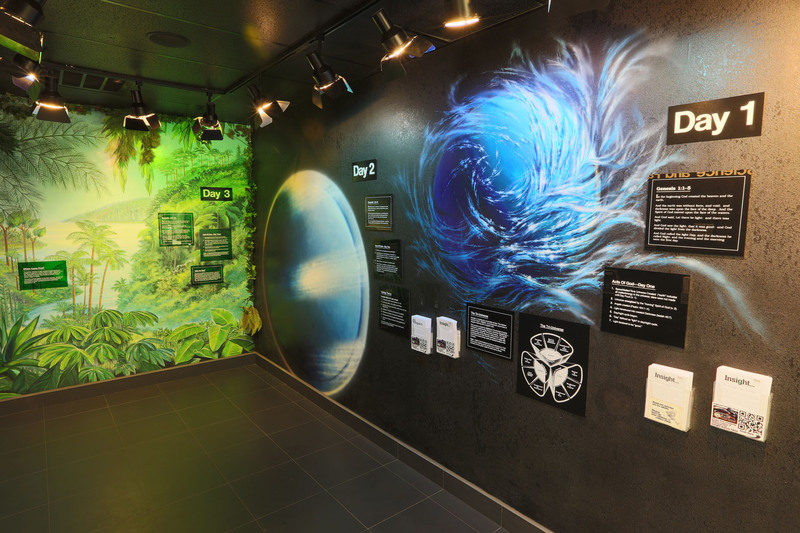 In the Days Five through Seven exhibits of the creation week, you can learn about: the creation of marine life and winged life on Day Five, the creation of land animals and mankind on Day Six, and God’s rest on Day Seven. Ponder God’s declaration of the whole creation as Very Good, the dominion mandate that was given to mankind, the confirmation of six-day creation, and the significance of the week. 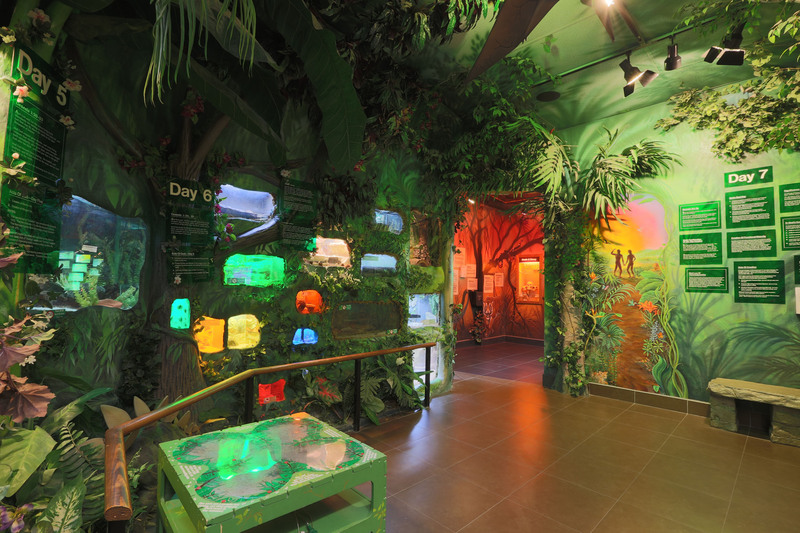 These exhibits feature an astoundingly beautiful preserved butterfly collection, other preserved insects and animals, and even many different live animals! At various times some of our animals are taken out and shown to visitors for educational purposes! Here we see perhaps the saddest event and that of greatest consequence in the entirety of human history. This exhibit depicts the time when man’s rebellion resulted in the sin curse. Sin and death first entered the world, and God’s very good creation was drastically changed. Consider the enormity and aspects of the sin curse, why God allowed sin, why people suffer, the second law of thermodynamics and more. Don’t miss the protoevangelium (the first Gospel) that foretells the coming of Jesus and how God revealed a glimpse of His plan to redeem mankind! 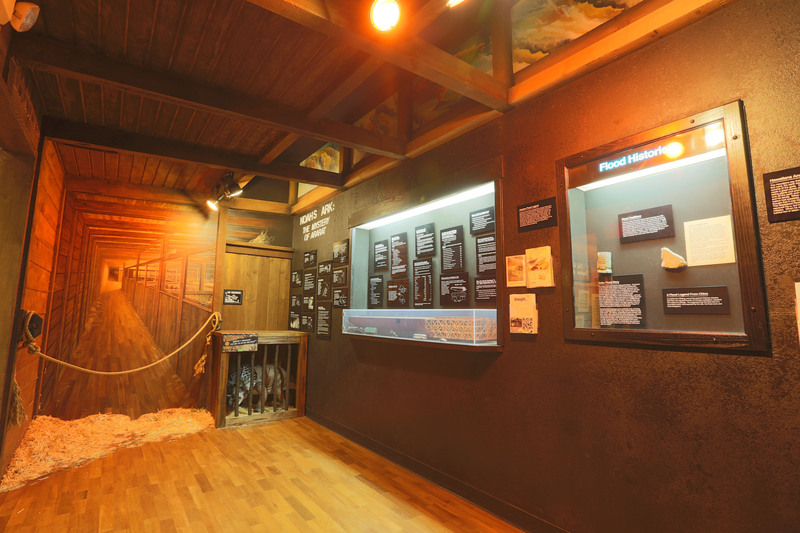 In this depiction of a room within Noah’s Ark you can investigate the finer points of the Genesis Flood and the ark. Read about: the purpose of the ark, the dimensions of the ark, stability of the ark, causes of the Flood, Flood traditions and legends and more. Find answers to these important questions. Do other ancient writings mention the Flood? How could fish survive the Flood? How could Noah have cared for the animals? How could all the animals be housed on board the ark? How did animals get to their present localities? 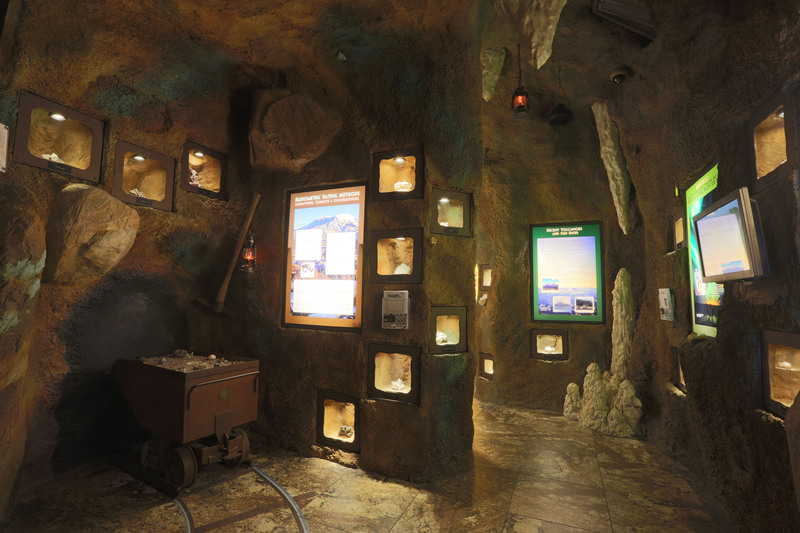 The Grand Canyon Room is broken into two primary displays that cover a vast array of geological evidences and explanations. Along the Flood Wall you will find: the description of the Biblical Flood, Biblical evidences of the worldwide Flood, geological evidences of the worldwide flood, the explanation of local geological columns and the geologic column itself, fossil formation, and how the fossils were ordered. In the Flood Layer portion you will find descriptions and explanations of: widespread strata, the ocean over the continent, how water eroded the landscape, rapid burial, how marine creatures were buried first, earth-wrenching forces, and volcanic eruptions. Consider how the Grand Canyon stands as a massive monument to catastrophe! Take a break and have a seat inside a volcano! 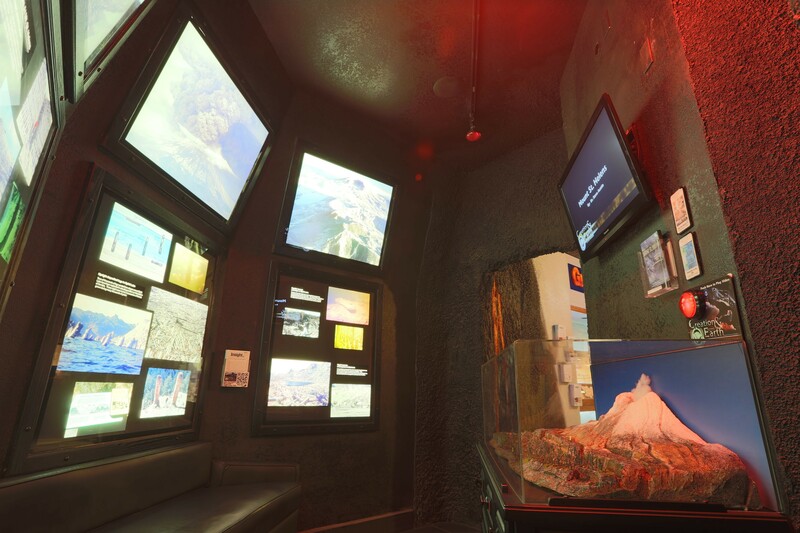 Explore the Mount Saint Helens room and examine evidences for catastrophism such as: rapidly formed stratification, rapidly eroded canyons, upright deposited logs in Spirit Lake, rapidly formed peat layers in Spirit Lake, and rapid recovery of the ecosystem in the blast zone of the Mt. Saint Helens eruption. Ponder how such catastrophic processes would have been at work during and after the Genesis Flood and what effects can be seen today. 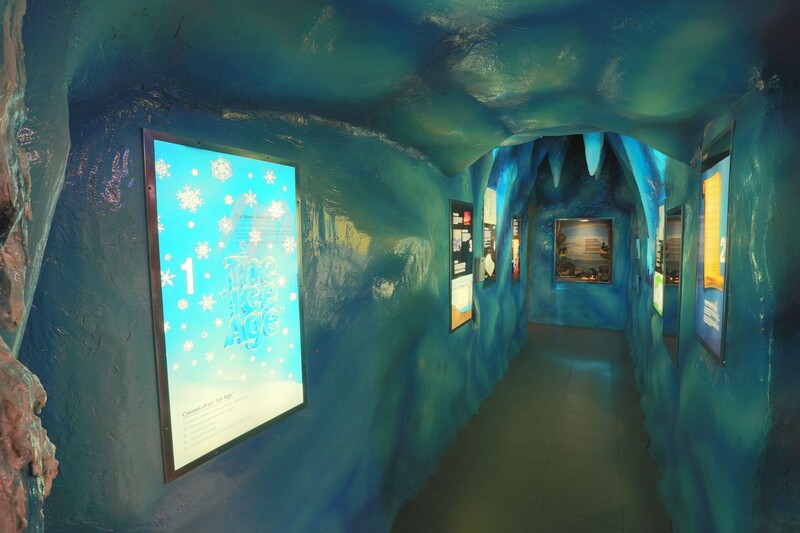 Take a walk through an ice cave and learn about how the post-Flood environmental conditions caused the great Ice Age and the geologic and biologic changes that occurred during that time period. Topics addressed include: the world after the Flood, causes of an Ice Age, environmental effects, effects on human life, human and animal migration, animals and the Ice Age, modern ice caps, and the Bible and the Ice Age. Did you know that these conditions are mentioned in several places in scripture? Don’t miss the genuine fossils on display in this exhibit from actual Ice Age animals! 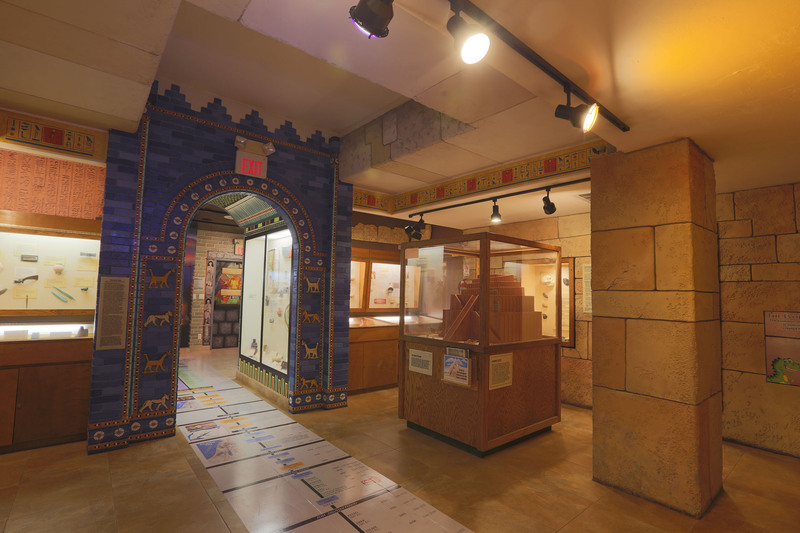 The Ancient Civilizations rooms of the Creation and Earth History Museum begin with the account of the Tower of Babel as described in the Bible. Topics here include: the confusion of tongues, the origin of language, the evidence of linguistics, the table of nations, worldwide dispersion, the origin of astrology, and the origin of so-called races. The exhibit continues into secular and creationist interpretations of: archaic Homo sapiens, Homo erectus, “cave men”, Cro-Magnon Man, Australopithecines and hominid fossils. Then the focus is upon archaeological artifacts, complete with accurate recreations, which not only provide compelling evidences for the accuracy of Scripture, but bring the Bible and the biblical time periods to life. After walking through a model archway of the famed Ishtar Gate, you find yourself immersed in artifacts from ancient pagan cultures with God’s evaluation of pagan religion as well as the Biblical perspective as to why nations rise and fall. Lastly you see the ancient civilizations through the time of Christ and the conditions in Rome at that time. Here you see the most important event in human history, the entry of the Creator into His Creation, and the provision of man’s salvation through the ultimate sacrifice of God incarnate. Read of the uniqueness of the life and death of the Lord Jesus Christ and the amazing fulfillment of hundreds of Old Testament prophecies by Him! Beginning with the Reformation and true science alongside the Enlightenment Period, walk through a hall depicting scientists and greatly influential men with strongly opposing convictions. Explore the influences, philosophies, and impacts of prominent creationists of the 18th and 19th centuries as contrasted with many prominent evolutionists of the same time period. Topics addressed include: the beliefs of the early church fathers, the flat earth myth, the Great Chain of Being, the immergence of new age philosophies, racism and the evolution connection, and abortion. Explore God’s amazing and complex design of the human body in our 2,400 square foot Human Anatomy Exhibit. 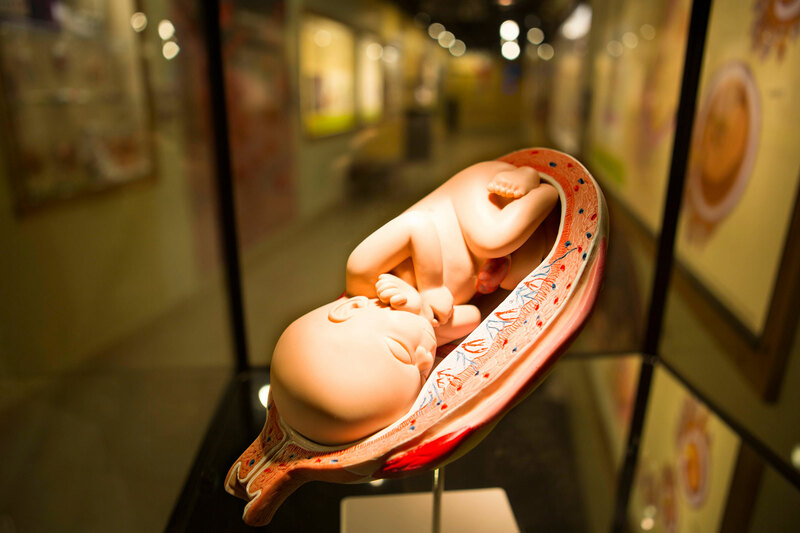 The New Human Anatomy Exhibit includes detailed wall displays, interactive lighted models, and videos which provide educational information on DNA, various types of human cells, organs, and organ systems, as well as the stages of human life beginning with conception. Colorful images of the amazingly designed human body include those of: primary tissue, skin, bone, and blood cells, each accompanied by plaques loaded with fun facts and descriptions that are great for any audience.